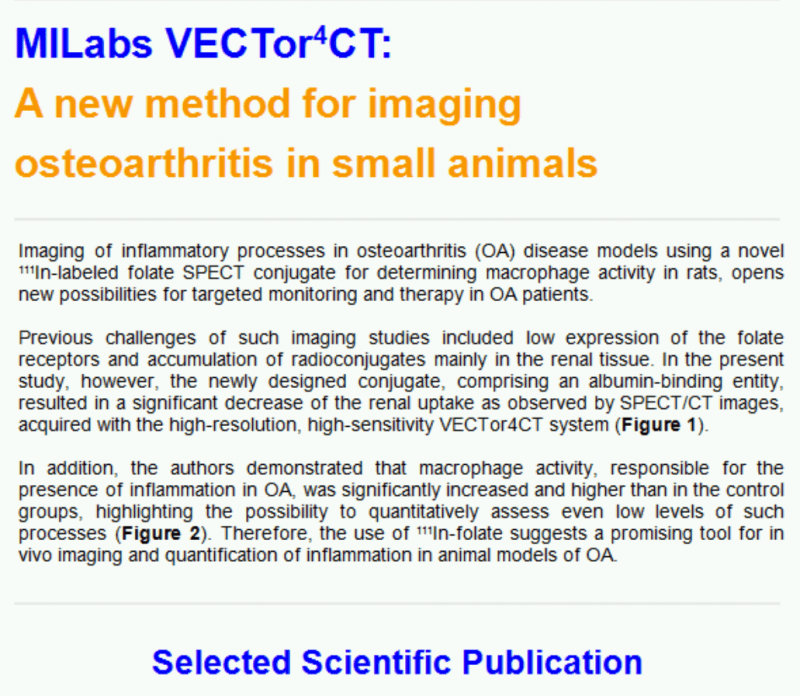 Imaging of inflammatory processes in osteoarthritis (OA) disease models using a novel 111In-labeled folate SPECT conjugate for determining macrophage activity in rats, opens new possibilities for targeted monitoring and therapy in OA patients. Previous challenges of such imaging studies included low expression of the folate receptors and accumulation of radioconjugates mainly in the renal tissue. In the present study, however, the newly designed conjugate, comprising an albumin-binding entity, resulted in a significant decrease of the renal uptake as observed by SPECT/CT images, acquired with the high-resolution, high-sensitivity VECTor4CT system (Figure 1). In addition, the authors demonstrated that macrophage activity, responsible for the presence of inflammation in OA, was significantly increased and higher than in the control groups, highlighting the possibility to quantitatively assess even low levels of such processes (Figure 2). Therefore, the use of 111In-folate suggests a promising tool for in vivo imaging and quantification of inflammation in animal models of OA. 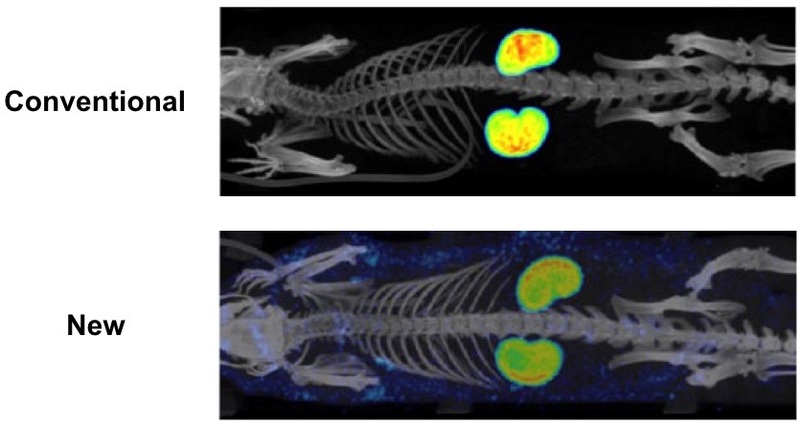 Figure 1: SPECT/CT images showing lower renal uptake upon administration of the novel 111In-labeled folate conjugate than the conventional tracers. Figure 2: High-resolution single-slice CT images co-registered with corresponding SPECT slices depicting signs of higher inflammation (groove model of OA, High-fat diet) than control groups. Demonstrate that a novel 111In-labeled albumin-binding folate radiotracer is suitable for SPECT imaging in small animal models of OA. Illustrate that the system can successfully image the groove model in rats with minimal joint inflammation and mild joint degeneration, resembling accurately the human situation of OA development. Conduct biodistribution studies demonstrating lower toxicity of the new folate conjugate than conventional folate tracers. 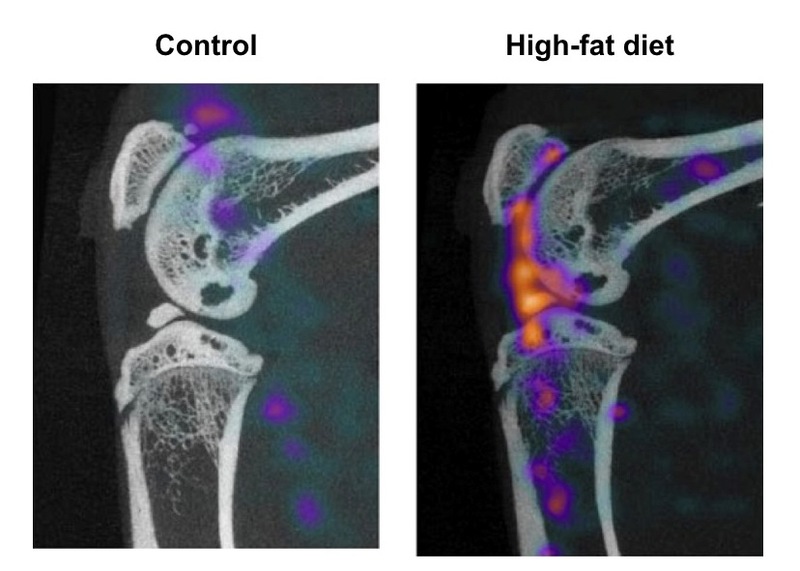 Illustrate through focused imaging that high-fat diet in combination with local cartilage damage results in increased macrophage activity. Conclusion: the new folate radioconjugate proved a useful tool to study the role of activated macrophages in the disease processes of OA.